State Farm Arena is conveniently located just feet away from the Dome/GWCC/Philips Arena/CNN MARTA station. The station is located on the Green/Blue (East/West) lines. If traveling from the North or South, you will need to transfer at Five Points Station onto a Westbound train. Once you get to the Dome station, simply follow the signs to State Farm Arena. You have the choice of going up a tall escalator or taking an elevator up to street level. A MARTA entry for State Farm Arena is across from the station exit. 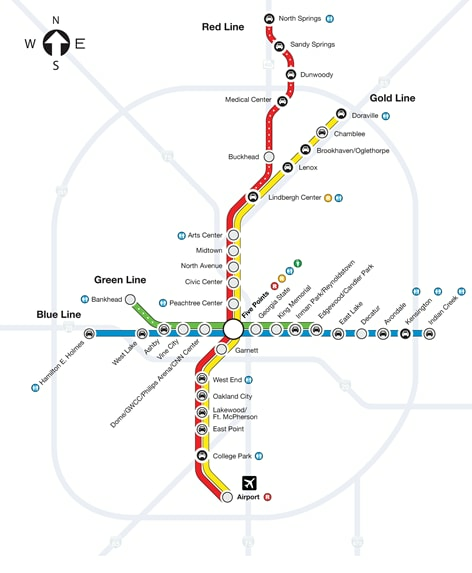 Click here to see the latest updates on scheduled service delays for MARTA.